Make a wish--for fewer weeds. How do weeds spread? This is a question that every gardener has asked at one time or another. Knowing the answer can help you to prevent the spread of weeds in your yard and garden. So, How do Weeds Spread Anyhow? Weeds spread in many different ways. Some ways you can control, other ways you can't. Weeds are often spread by the wind. 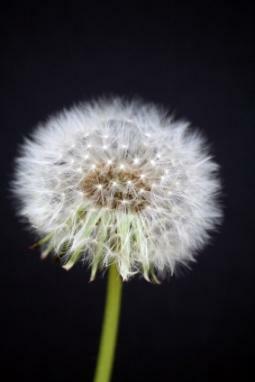 You've no doubt witnessed this when, as a child, you picked the fluffy, white dandelions gone to seed, made a wish and blew with all your might to see the seeds fly away. You've probably also cringed as an adult when you see other children do this. If only they knew. Dandelions aren't the only weed with seeds that float away on a stiff breeze. Many other types of weeds are designed to be picked up by the wind and carried to a neighboring field. Once there, they will germinate and grow in their new home. How do weeds spread in water? Some weed seeds are spread when water flows over a property via a drainage system or even due to flooding. Once the water subsides, the seed settles into its new home. How often have you had to pick thistles out of your dog's coat? Rover isn't the only way that animals spread weeds though. Often weeds have fruits that animals like to eat. Birds, deer, lizards and other animals consume the fruit seed and all. Later, the seed passes through the animal and is excreted. Amazingly, the seed is still viable and will germinate wherever it has been deposited. Yes, you may be contributing to the spread of weeds and not even know it. Just as seeds get hooked on an animal, they get hooked on your clothing too, but that isn't all. Do you like to ride your bike on secluded trails? How about four-wheeling? Fragments of weeds get attached to these vehicles and end up in new places to grow.Even aquatic weeds can be spread unwittingly. Some people dump their fish tanks out in a pond or some other body of water. They do not realize that some aquarium plants are actually aquatic weeds that can cause a problem in their new ecosystem. Have you ever seen people digging up the beautiful "wildflowers" on the side of the road? Well, not only is this illegal in many places, but it also contributes to the spread of weeds. When you buy manure, old hay or straw from a local farmer for your garden, you may be bringing weeds into your yard as well. Cheap wild birdseed or even grass seed can also contain weed seeds. Weed seeds can even survive being composted. Did you know that some places have laws about the spread of weeds? Yes, you are legally required to be careful about the spread of weeds. In fact, you are even required to report sighting of certain types of weeds so that they can be destroyed. Of course, this isn't about reducing the number of dandelions in your lawn. These laws are about controlling the spread of noxious weeds that can be damaging to the environment. According to the U.S. Department of Agriculture, there are 90 weeds federally declared as noxious. Weeds legally termed "noxious" are weeds that are especially difficult to control or undesirable for other reasons. Individual states may have other weeds that they add to the list as being "noxious". You may think that weeds are just an annoyance in your flower bed. However some weeds are far more than an annoyance. As an example, Yellow Starthistle is a noxious weed that has taken over many millions of acres of land in California. This weed is actually rather pretty with a bright yellow ball of a flower and yellow, inch-long spines. Despite its apparent beauty, horses that are forced to graze on this unwanted infestation can end up with "chewing disease". Toxins in the plant affect the horse's brain, making it unable to control its facial muscles in order to chew its food. Another example is a weed called Purple Loosestrife. This noxious weed takes over wetlands endangering waterfowl habitats as well as clogging drainage ditches. Originally from Europe this purple-flowered plant can produce two and one half million seeds a year. Yes, that is one plant. Next time you are out hiking, think about what you may be bringing home. Think about how you can help control the spread of weeds. Learn more about noxious weeds by checking out the Federal Noxious Weeds List and by visiting the Animal and Plant Health Inspection Service website.